Breakfast- Scrambled eggs, Ezekial toast, blueberries, and green tea. Lunch- Lentil and Barley soup with a side salad of baby spinach, onions, and cucumbers. Snack- Hummus and raw veggies. 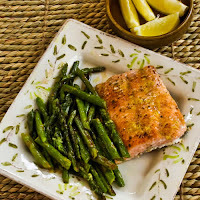 Dinner- Grilled salmon with asparagus, and Quinoa.